Note: This is Naked Receiver! Set your transmitter to D16 (different than the D4R-II receiver), manual . – FrSky's X4R-SB receiver features 3 PWM outputs (normal servo) and 1 Sbus port that carries all 16 channels. Plus the exciting new Smart Port and a traditional A2 port are all located on the side port of the receiver. 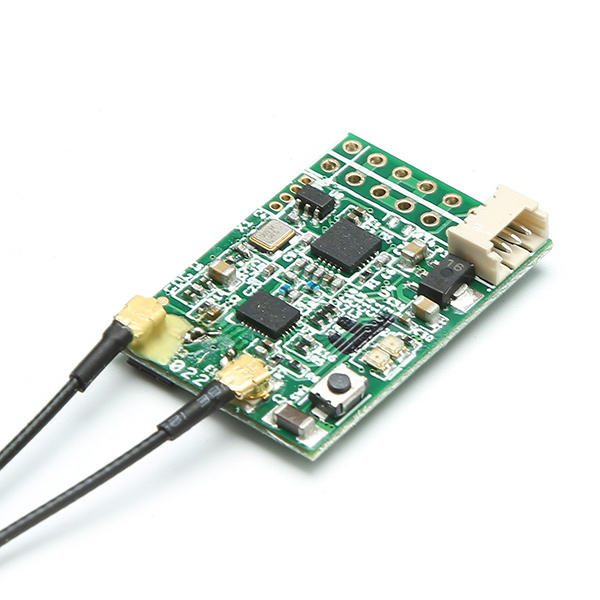 A FrSky FBVS can be connected to the A2 port for simple voltage monitoring. – Smaller than the X6R, but still packing 16 channels and the new Smart Port that supports the new hubless digital sensors! Or, connect the new vario, and then connect the old hub to use existing analog sensors. – A common question is what can the SBus port do. First off, you can connect it to many flight controllers via a single connection, and now you have access to all 16 channels. Or, you can use something like the FrSky Sbus Decoder, this will allow you to add 4 normal servo outputs (pwm). You can also connect Sbus servos directly to the Sbus line. Just "Y" in as many SBus devices as you need.